The Philippines is a country blessed with natural wonders that attracts people to visit time and again. Every island has a beautiful spot that appeals to the eye of the beholder and places that make you want to call it home. For vacationers who are contemplating of visiting the Philippines for the first time, here is a list of the top 10 attractions in the Philippines based on the number of local and foreign tourists visiting. The Subterranean River National Park in Puerto Princesa, Palawan was recently declared as one of the 7 Wonders of the World and one of the World Heritage Sites named by UNESCO. The underground Cabayugan River is located in the mountain ranges of St. Paul about 81 kilometers north of Puerto Princesa City facing the South China Sea. The river winds inside the cavernous chambers spanning a distance of no less than 8 kilometers, one of the longest underground navigable rivers in the world and houses an amazing bio-diversified flora and fauna endemic to the place. The major stalagmite and stalactite formations are spectacular; cathedral-sized chambers and high domes dominate the place engulfing visitors with awe as their boat snakes through the winding river before emerging to the sea. Rare mineral deposits have been found inside the cave and near extinct mammals have been found to inhabit the forest surrounding the area. The entire park is being managed by the city government of Puerto Princesa, Since this the Underground River is the #1 of the top 10 attractions in the Philippines, expect plenty of other visitors. We highly recommend that you arrange your tour months in advance. Chocolate Hills, located in Bohol province, is a breathtaking panorama of mysterious, almost symmetrically-shaped mounds of earth scattered over the three municipalities of Carmen, Batuan and Sagbayan. The conical hills reach the height of 30 to120 meters at its highest and turn chocolate brown (hence the name) during summer. The mounds numbering to as many as 1,776 are believed to be coral deposits that have grown out of the surface after being submerged in sea water for many centuries. UPDATE: The Chocolate Hills were partially damaged by the magnitude 7.2 earthquake that hit Central Visayas in October 2013. Efforts are currently underway to restore this top attraction in the Philippines. Local legends speak of a broken-hearted giant Agono who fell in love with a native girl named Aluya. The giant’s unrequited love broke his heart and his gigantic tears that fell to the ground hardened and turned into these enchanting hills. This natural wonder is best seen at a vantage point from the viewing deck of the Chocolate Hills Complex in Carmen. The Mayon Volcano is famous for its near-perfect cone that draws thousands of visitors every year. Mt. Mayon is an active volcano that has many records of cataclysmic eruption that killed many people living at the slopes of the peak. Its first recorded devastating eruption was in 1616, a tip of a belfry is a mute witness to the apocalyptic pyroclastic flow that claimed more than a thousand people and destroyed millions of pesos in crops and properties. Despite of the frequent seismic activities displayed by Mt. Mayon, it continues to mesmerize visitors from all over the world. During the summer months of March to May, you can see a clear view of the peak without the clouds capping its tip. It is approximately 8 hours by bus from Manila to Legaspi, Albay where the volcano sits in its entire splendor. The Rice Terraces of the Cordillera Mountain Range are clusters of rice paddies carved out of the mountains in the Cordillera highlands. The terraced plots were painstakingly hand-crafted more than 2,000 years ago by the forefathers of the Ifugao tribe who lived on the land. Located approximately 5,000 feet above sea level and spanning about 10,360 square kilometers of mountainside, these paddies are naturally irrigated by waters coming from the watershed in the upper slopes. A man-made wonder, this site is a reminder of the Filipino’s ingenuity and resilience in adapting to nature’s frivolities. To date, the rice terraces are still in use although certain portions have been eroded by the changing weather conditions and neglect. Proclaimed by UNESCO as one of the World Heritage Sites, it draws many visitors every year. Mt Apo is a potentially active peak located between the provinces of Cotabato and Davao del Sur and Davao City. It has an elevation of 2, 954 meters and is the highest mountain in the Philippines. Mt Apo has no clear historical records of seismic eruptions and its challenging trails and ecological diversity continues to tempt local and foreign tourists to conquer this majestic peak. 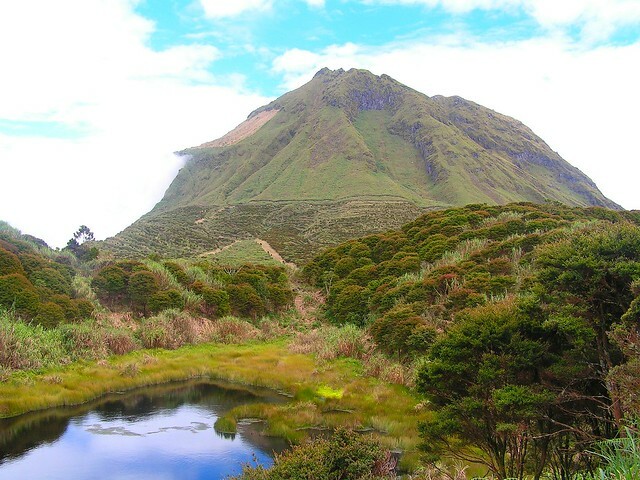 Climbing Mt Apo can be an exhilarating experience, the 2-3 days hike starting from the Agko Hot Springs, across several streams and craggy slopes are not for the faint-hearted and the weak-kneed. Local guides can take you up for a minimal fee. Be sure to pack the proper mountain climbing gear such as tents, backpack for your provisions and clothing, water container, hiking shoes and lots of stamina if you plan to climb Mt. Apo. Boracay Island is a seemingly endless stretch of fine white sand with crystal clear waters located some 300 kilometers south of Manila. The 7 kilometers-long isle of white sandy beaches is a favorite summer getaway of local celebrities and foreign tourists. The influx of tourists every year has made the White Beach one of the top holiday attractions in the world and it remains to be the most-visited among the top 10 attractions in the Philippines in this list. Some of the finest hotels and resorts in the Philippines can be found on Boracay Island. The surrounding reefs are perfect diving spots. You can hire professional diving instructors if you wish to explore the depths of the ocean. The climate is very tropical thus; the sun is scorchingly hot during summer and the pristine white sands can be blinding. When sunbathing, make sure you use a high SPF sun screen protection to avoid being sunburned and sunglasses to protect your eyes. White Beach can be reached via a 10-minute boat ride from Caticlan where daily flights from Manila are available. Tubbataha Reefs Natural Park in Palawan is a protected marine sanctuary in the middle of the Sulu Sea comprising three atoll reefs, the North and South Atolls and the Jessie Beazley Reefs measuring about 22 kilometers long. The park is 150 kilometers southeast of Puerto Princesa City and can be reached only by boat. The park protects almost 1,000 hectares of prime underwater habitats that is home to the most extensive collection of rare and endangered marine species. Diving enthusiasts all over the world explore the vast reefs and enjoy the underwater panorama in vivid colors. Recognized by UNESCO as one of the World Heritage Sites, Tubbathaha Reefs attracts divers in huge volume during the months of March until June where the sea is calm, skies are clear and the sun is at its brightest, illuminating the depth of up to 45 meters. Vigan Heritage Village is located in Vigan City, the capital and the provincial seat of Ilocos Sur. “It’s like a blast from the past” is what most visitors say of Vigan Heritage Village. The predominantly Spanish and Chinese architecture of the town has been perfectly preserved; surviving the destruction during World War II. The famous cobblestones paving the streets of the town and the 16th century façade of the edifices are popular tourist attractions. Tour the town in a “kalesa” a horse-drawn carriage that is the only mode of transportation allowed around the place, lending authenticity to the centuries-old Vigan. Taste its incomparable “Empanada” (local bread filled with potato and meat) while scouring the antique shops along the street and bring home mementos of your visit. Taal Volcano is located in Tagaytay, about 50 kilometers from Manila, the capital city of the Philippines. Taal is a complex volcano with history of violent eruptions in the past. In the middle of the lake (which is also a crater) is Volcano Island, the smallest volcanic crater in the world. It is fondly called “an island in a lake in an island in a lake”. Catastrophic eruptions have been recorded since the pre-Spanish era wherein thousands of lives were lost and extensive properties damaged by fiery basaltic magma flows. You get a magnificent panorama of the Taal Volcano and Lake from the viewing deck of Tagaytay Ridge, where picnic huts and other attractions are offered. A resort at the ridge offers cable car ride, zip line and horse-back riding. Divine Mercy Shrine stands majestically on top of the Divine Mercy Hill overlooking the Macajalar Bay in the newly chartered city of El Salvador, about 30 minutes away from Cagayan de Oro City. The shrine is a 50-foot concrete statue of the Divine Mercy that stands like a lighthouse guiding fishermen in the Bay. It is fast gaining popularity and is one of the top attractions in Mindanao with the sharp increase in visitors in just a span of 2 years. The gradual construction of the site began in 2000 with the help of hundreds of devout Catholics all over the world, heeding the visions sent by God to a group of devotees to build His Church of Mercy in the city of El Salvador (The Savior). Behind the statue is a spring that is said to have healing powers according to testimonies of people who were “healed” of their afflictions.